Carl Cox- the Revolution 10th Anniversary Opening party is taking place at Space tonight and we can’t contain our excitement. Especially since we got to speak with the man himself, Carl Cox or ‘Coxy’ as some would like to call him, about all the juicy details and more! I’m not the first to say it, but Carl Cox really is the most down to earth DJ I’ve ever spoken with- it’s like you’ve known him for years and what I liked most was that he just tells it how it is! Well, thank you Carl, for being so normal, like the rest of us lot despite the fame and success. When asked why it is that he’s considered one of the UK’s favourite DJs he replied, “I’m not looking for hit records, or to be on MTV or looking to hook up with RnB artists or anything like that. All I’m looking forward to doing is basically sharing part of myself with people who also enjoy what I love, which is music and that’s always been my bottom line.” He said his working class background had given him many attributes, as well as distaste for the VIP concept, “I hate the whole VIP thing, so if I’m able to be involved in the VIP area, I’ll say yes thanks but I actually want to be on the dance floor (haha). That’s why I’m there; I don’t want to be sitting there chatting away, when the DJ is playing such great music!” What I really like about Carl is that he has a lot of time for his fans, “when someone asks for a photo- I’ll be like yeah just take one, it’s not like, no I’m too busy, get security or anything like that. Forget it- I understand what it’s like to be a punter because I used to be one”. As you know, Carl’s heart and soul is with Space, calling it “the rolls Royce of clubs” and helped it go from strength to strength over an amazing 10 year period, but we asked what it’s like to stay with a club that long. Carl put it simply, “being involved with anything for 10 years solidly every year, is a labour of love more than anything”. Of course Carl has his own commitments too, for example he’s recently played in Japan, Australia, as well as just returning from Glastonbury, and now he’s back in Ibiza for the Carl Cox 10th Anniversary opening tonight! We can only image how much energy one would need to fit this in the space of a month! Being committed to Space is certainly an understatement! Carl is very much part of the clubs legacy of course, taking it from a daytime club on a Sunday with the capacity of around 3, 500 people, to one of the best super clubs in the world that now holds over 10,000. “When I took on Space I decided to create a whole new ethos of clubbing and I don’t know if it would be as popular today if we hadn’t have done it”. So when we asked him how playing at the Space opening party went this year and it’s no surprise he said it was phenomenal to say the least, “we say this every year but [Space opening party] really was probably the most amazing party I’ve ever been to. It really was sensational”. Carl came on at 4 in the morning until 8am, “people were still there dancing [at 8am]. Crazy! If you think about doing any party like this in the UK it would never happen in such a way- Ibiza is the only place you are able to do that and it’s an experience you can’t get anywhere else”. We wanted to know more about Carl Cox’s plans for the 10th Anniversary opening and the amazing 10 hour set he’s planning on playing, “I decided if I’m going to close this room off properly, I’m going to play from beginning to end”. It was exciting to hear that every hour; Coxy will be dropping an old school tune that defined that year, so by the time the 10 hour set is up you would have been listening to the most defining records of Carl Cox at Space to have ever been played. “There’s one track in particular that came out on my record label that I’m very proud of, it’s a track called Sunshine. This record makes the dance floor erupt! Jaguar is another record that was a massive defining moment in the history of what we do. You can be sure you’ll be hearing those two during the ten hour set of Carl Cox”! Obviously Coxy travels all over the world to play his DJ sets, but we wanted to know what it was about Ibiza that keeps him coming back, “I’ve been going to Ibiza since I was a very young lad, I was about 17 years old, and have been going every year since then. I absolutely love the island and have always enjoyed it because it s so small it has so much to offer”. What came across is Carl’s love of the people, “It’s not just about clubbing and staying out all night and having it large. You can meet the locals, eat the family recipes in some of the amazing restaurants there, get to go to some amazing beaches and see amazing sunsets and meet people that also feel the same, whether they’re hippies or millionaires or are clubbers for the first time”. It seems Ibiza encapsulates Carl’s overall philosophy of being yourself, “you could have a spaghetti bolognaise and a Diet Coke in San Antonio if you want- no-one cares”. 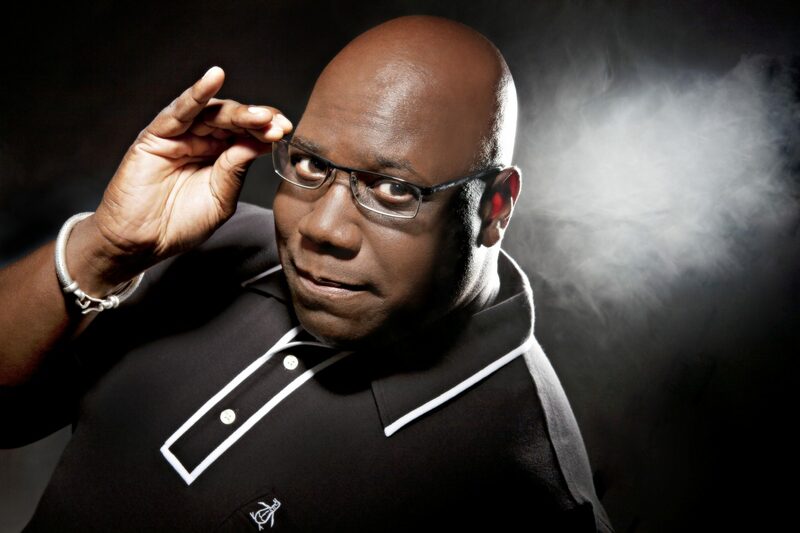 So what’s on the cards for Carl Cox in the near future my little Ibiza lovers? Well, I’m sorry to say not much, “I think I’ll give myself a massive holiday- go to Benidorm and play golf!”- only joking of course!! Carl is going to be busier than ever- he’s got a new album coming out, which he’s planning to perform live in the near future, as well as looking to sign more and more artists to his record label InTec, and not to mention continuing with his radio show, Global, which is now syndicated to over 25 countries worldwide and with over 12 million listeners every week! Phew! Will you ever stop Carl, is the question? “I’m just going to be continuing doing what I’m doing until one day I’ll go, right I’m done and then I’ll just walk away gracefully but leave the legacy of what I’ve created- signing records and doing Carl Cox events and that kind of thing”. We hope this doesn’t come around any time soon. Carl Cox it’s been a pleasure!